Fernando Stalla, Bicho Jimenez and Erika Benitez have tentatively booked their tickets to Fiji following strong performances at Mexico’s National Titles over the weekend. 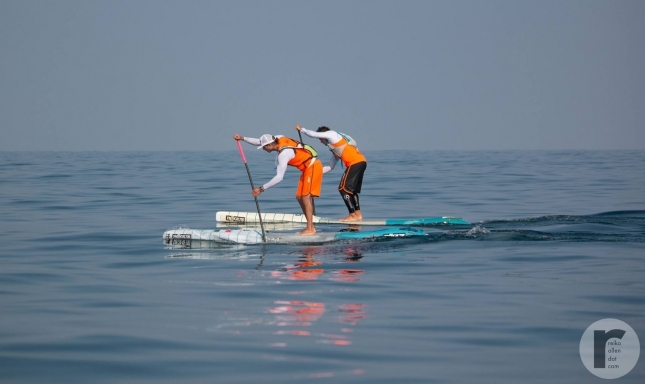 The “Seleccion Mexicana De SUP” event was held in the paddleboarding mecca of Sayulita, a rather appropriate venue for an ISA World Championship national qualifier given that the town hosted the previous ISA Worlds exactly 12 months ago this week. Fernando, a veteran of Team Mexico, showed vintage form to dominate the racing events, claiming a narrow win ahead of good friend and close rival Bicho in the distance race on Friday before comfortably winning the course race on Sunday. Fernando and Bicho were side-by-side in the distance race almost the entire way (see below), with Bicho attempting to channel the spirit that saw him break away from an all-star field and go oh-so-close to claiming gold in the championship race here 12 months ago (he eventually settled for silver behind Danny Ching). However this time it was Fernando who made the break, catching a small wave as they headed for home to run up the beach to win in a time of 1:03:23 vs Bicho’s 1:03:39. Julio Adrian Gonzalez Rios was third in a time of 1:05:49. Fernando had it a little easier in the course race, catching a break to win almost a full minute ahead of Bicho in 22 minutes 18 seconds, with Julio once again taking third. In between, Fernando backed it up with a runner-up finish in the SUP surfing, which was won by Felipe ‘Pipe’ Rodriguez, while 2015 ISA finalist Felipe Hernandez was third and Bicho fourth. On the women’s side of the draw, rising junior star Erika Benitez, who lives and trains in southern California where she’s been a fixture on the local race scene this year, was unstoppable, taking the distance/course race combo ahead of Alejandra Brito. Karen Jacobson took out the women’s SUP surfing event. Erika has shown great form the past six months, winning San Diego’s big Hanohano race back in January and enjoying a string of podium placings. The world watched as Erika took off like a rocket during the final of last year’s women’s world championship course race in Sayulita, where she briefly led the entire field. The youngster was eventually overtaken by Candice Appleby and co, but as Erika’s paddling matures it will be more and more difficult for the established names to shake her. The 2016 ISA World Championship will be held in Fiji from November 12-20, with Mexico looking to continue their long tradition of punching above their weight and bringing home medals. The video up top from Wicked Fotos sums up the event, while there are plenty more photos over on the official Facebook page.